I, along with a group of my fellow bloggers, were kindly invited to see a theatre show, 'The Wrong Side of Prohibition' by Thespis Project at Tigermilk at The Duke on Saturday. Thespis Project are a theatre company based locally in my hometown of Plymouth. Being the theatre nut I am, to discover a new theatre company in our little city is very exciting. Plymouth has so much potential to be a beautiful creative hub of innovative art and Thespis Project proves that its out there with a willing audience. 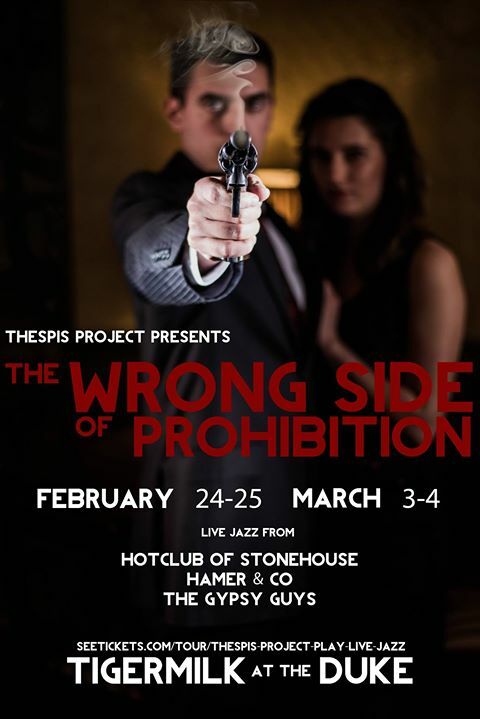 Their new show, The Wrong Side of Prohibition, is an immersive piece of theatre set in a cool, quirky 1920s speakeasy bar which aptly takes form as Tigermilk at The Duke- the ultimate hot-spot in Plymouth for exciting cocktails and smooth jazz. The piece is completely immersive, with actors walking around the tables, breaking the fourth-wall with the audience- its a truly unique and intimate experience. The show follows the story of Tony, the manipulative gangster owner of a 1920s prohibition bar, who stands up against anyone denying his power as he controls the team of showgirls, including a young Greek immigrant called Anna. They battle at the time of prohibition, with Tony's inevitable failing moon-shining business. The hour- long piece tells stories of forbidden love, crime and death. The show is completely packed with drama and the intimate feel of it all engaged the entire audience throughout. The performers were fantastic in acting in such a unique setting and really made the experience as authentic as possible. The piece was well received by the audience and I know that Thespis successfully sold-out their remaining performances- proving a hit in Plymouth. It was really nice to catch up with all of the performers for a cocktail afterwards too! The team were really enthusiastic about their work and their future as Thespis Theatre Project. Big thanks to Thespis Theatre Project for inviting us along to their great performance and for Tigermilk at The Duke for hosting us. Disclaimer: I was kindly invited along to this event by Thespis Theatre Company but all thoughts and opinions are my own, as always.